The foam is ready! The foam is very rough, porous and fragile. It would easily break under the weight of the clay without an armature support. You can see that there has been a heavy-duty backiron attached to the base - this supports the figure from inside the foam with an armature. There is also an armature in her outstretched arem and into her hands and fingers. Duchateau made the 3d scan from the maquette (you can see the maquette on the table in the background under her outstretched arm) and blew her up to the appropriate size. It’s important to remember that the materials used in casting all shrink. 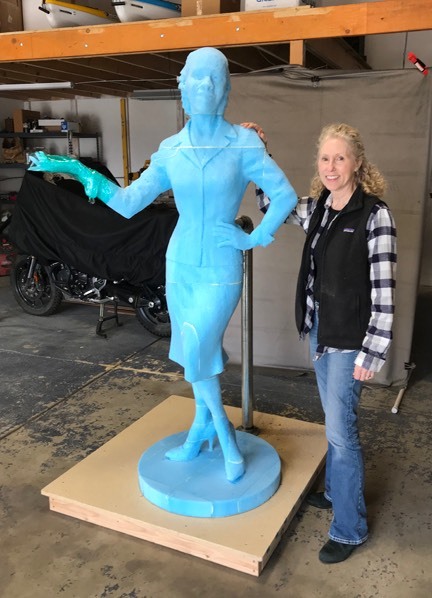 If I were to sculpt the work to be 5’7” tall exactly and we made the mold of the clay and cast in wax…once the wax cooled it would shrink a bit. So now she is perhaps 5’6” tall. 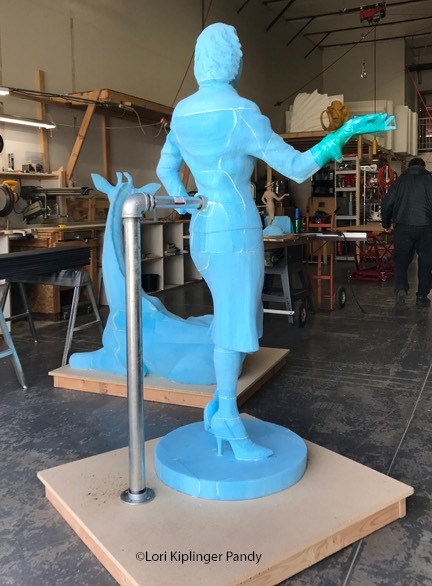 Then the wax is cast in bronze and when the bronze cools, it also shrinks - so now she is perhaps 5’4.5” tall. To compensate for this we needed to figure between .25” and .5” per liner foot shrink rate and scale up accordingly so she is larger than 5’7” (without heels or hat) to allow for the this shrinkage. 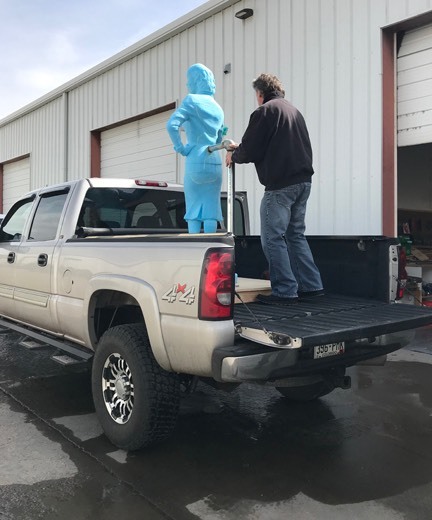 We have our truck ready and my husband is preparing to lay the work down on the backiron and secure with tiedown straps for the trip back to the studio. 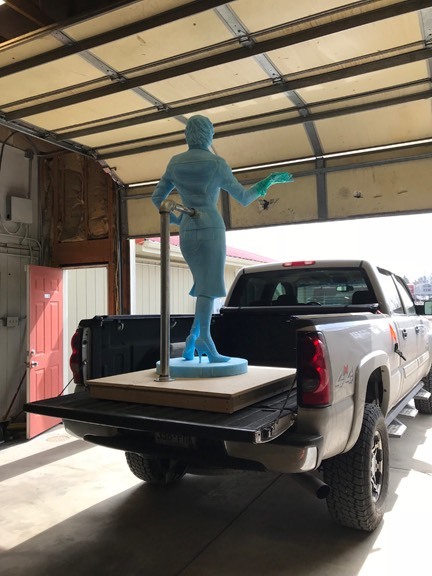 Luckily this week is clear - after the blizzard last week delayed the work for a few days - so we are able to get the foam enlargement safely back to the studio and begin unloading. The enlarged foam now in place and ready for the next stage of work. The foam enlargement is quite rough - all detail is obliterated and there is no hat or purse as this simply couldn’t be scanned and milled in foam - the foam is too fragile and would break - unable to go that thin. The head looks odd - large are lumpy as there is a bit of distortion that happens when scanning small detailed areas - the undercuts build up and become a mass with no real detail so that will be cut back. Also odd looking because the hat isn’t in place. The foam will be carved back where needed before I begin applying the clay and I’ll need to make a hat armature to add onto the sculpture. First up will be turning on the shop heater to heat up the studio space and then cutting up a case of Jmac Classic clay in medium to prepare for working life size.